This feature is very useful for managing a large number of transfers. Once transfers have been organized into a group, they can be started, stopped, throttled, or have other advanced features adjusted in aggregate. 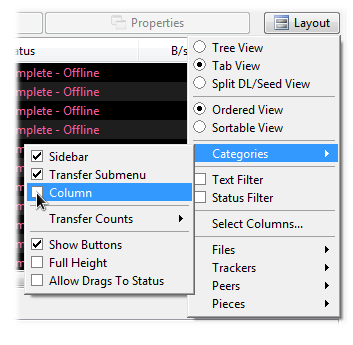 Activate the categories feature from the layout menu in the transfers window. You may also want to activate the category column from the layout menu. 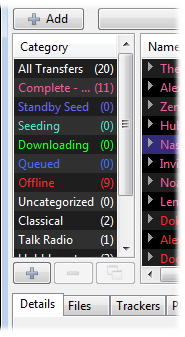 The category side-bar will appear to the left of the main transfers list. Transfers can be added to a category by dragging with the left mouse button or by right-clicking and using the Category submenu. When a category is selected, the transfer list will be filtered to contain only those in the matching category. The list can be customized by clicking the + button to add a new category, clicking the - button to remove selected categories, or by dragging items to re-arrange the order. Note the three types of categories. Separators are special items. 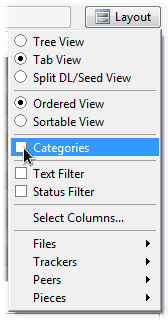 When selected, they show all items from categories below them until the next separator or the bottom of the list. This can be useful for creating a hierarchy of categories and sub-categories. 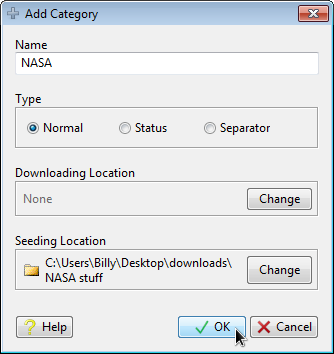 If a downloading or seeding location is set, this will be applied to any transfers moved into this category. Once categories have been created, the transfers within them can be controlled by right-clicking a category and selecting options from the popup menu. 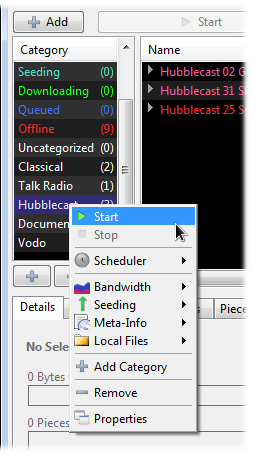 The Category Properties window contains several options as well as bandwidth monitoring and throttling controls.